Motor unit recruitment depends on the force/resistance of the exercise. With light intensity exercise the Type I (slow twitch) motor units are recruited. When the load is increased, the Type IIa (fast twitch) will be recruited with the help of the Type I fibers. When the load becomes even greater, the Type IIx will be recruited with the help of the Type IIa and Type I motor units. Therefore Type I motor units are always firing no matter what the intensity. 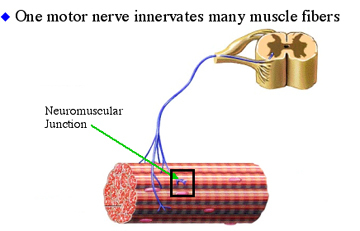 Learning Tip: Notice in the above graphic how the author is depicting the motor unit with ONE nerve innervating multiple muscle fibers on the left side of the graphic. With the top picture, the load is light for the exerciser and the Type I motor units have been innervated. In the middle picture there are more plates on the bar and thus more force to overcome. The Type IIa is doing most of the work with the help of the Type I. 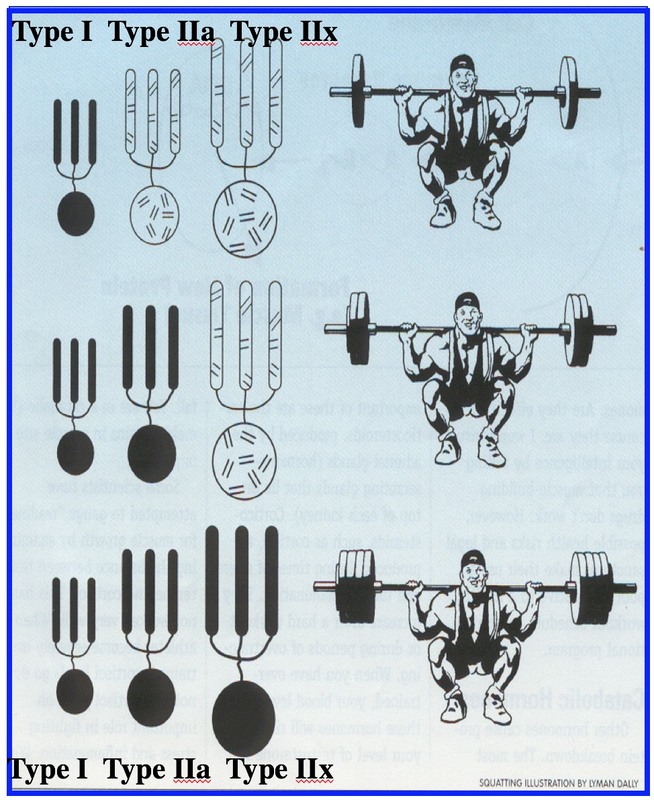 In the bottom picture, there are many plates on the bar requiring near maximal exertion of the exercise. This recruits the most powerful motor units in the body, the Type IIx and you see the Type IIa and Type I are helping. Thus with any load of work you notice how the Type I fibers are always firing. The Motor Unit: What two different anatomical constituents compose a motor unit? What is the All-or-None Response of Motor Units? When the neuron impulse fires, all of the muscle fibers innervated by the nerve will contract. When the neuron ceases to fire, all of the muscle fibers innervated by the nerve will also cease to contract. This is the all-or-none response of motor units.